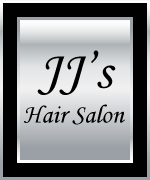 JJ's is a friendly family hairdressers welcoming ladies, gents and children and offering all types of hairdressing. JJ's is owned by long-time friends Jackie and Jane, who have many years of experience in the hairdressing profession. Jackie and Jane, together with their bright young staff, offer a great service at an excellent price, in the relaxing atmosphere of a comfortable modern salon. JJ's is enjoying its tenth successful year and is proving to be very popular. We hope you will visit us soon and join our increasing list of satisfied customers! JJ's is situated in a residential street just five minutes walk from The Spires shopping centre at High Barnet. JJ's can easily be reached by car with good parking available and is well served by public transport.